The Office of Missing Persons (OMP) recommends the Government to pay a subsistence allowance to the family members of the missing persons, OMP Chairman Saliya Peiris PC said. The Chairman was addressing an event at the J R Jayewardene Center in Colombo yesterday to mark the ‘International Day of the Victims of Enforced Disappearances’ together with a large gathering of the family members of the missing persons, government officials, civil society members and representatives of foreign missions. The OMP, which is mandated to search, trace and clarify the circumstances of missing persons and provide reparation, psychosocial support and other assistance to family members of the missing persons, has come up with a series of recommendations in its first interim report. The report will be presented to President Maithripala Sirisena next Wednesday (September 5). The Chairman, explaining the key recommendations made in the interim report, said the interim economic relief measures proposed by the OMP should in no way compromise the right of those victimized families to know the truth and mete out justice. He said the OMP recommends paying an interim allowance to the families of victims of enforced disappearances until the investigations are concluded. The OMP interim report also recommends that the Government authorities including the Police and Security Forces should cooperate with Habeas Corpus cases filed by the family members of the missing persons. “We understand that there are threats and various influences on victims and witnesses of enforced disappearances and this must stop,” he added. The Chairman also pointed out the OMP had proposed several amendments to the Parliamentary Act for Protection Against Enforced Disappearances which was passed into law early this year. Chairman Peiris, observing that Sri Lanka lacks technology and facilities to investigate mass graves, said the OMP recommends obtaining the technical expertise in this aspect. The OMP in its interim report has also recommended that the Government must allow public commemoration of missing persons and erecting monuments in their memory. Going a step further, it has also suggested national level commemoration of missing persons. “If we are to achieve true reconciliation as a country, we need to acknowledge that people have disappeared in this country over the past many years,” he remarked, noting that it was for the first time that the UN Day for the Victims of Enforced Disappearances was observed with state patronage in Sri Lanka. 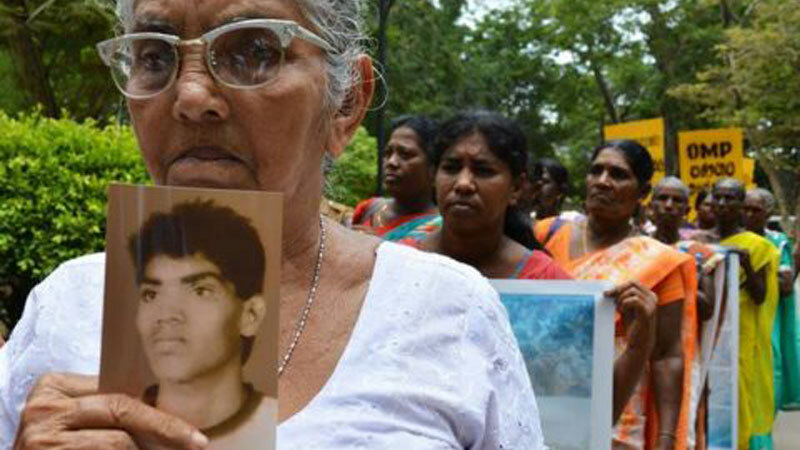 “The number of missing persons in Sri Lanka is considerably high. This problem needs long-term solutions. Some are reluctant to accept this fact. Some who are responsible for the enforced disappearances are moving freely in society. There had been times where the perpetrators of enforced disappearances were celebrated as heroes, while the victims were accused as traitors,” he noted. Prior to the commencement of the event at the J R Jayewardene Centre, the family members of the missing persons, about 200 in number, held a peaceful demonstration carrying banners opposite the Lotus Tower. The national anthem was sung in both Sinhala and Tamil at the beginning of the ceremony.